Led by 'TC' (Trevor Dand), these sessions attracted anything from a dozen to 50 people on a Tuesday evening, singing their hearts out and playing all sorts of acoustic instruments. The sessions provided a wonderful opportunity to meet musicians at all levels of experience, learn new songs, try out new material before a respectful audience, sing a song just for fun, or experiment with harmonies in a large group. A community founded on music was taking shape. Most Tuesdays people would 'come back to our place after' and sing on till tomorrow. New venues started springing up, and a real high point was The Big ('it's not a "bus", it's a "coach"') Trip to Alice Springs, 1987. They practised Scarborough Fair (with canticle) at Mary's kitchen table, and sang it at the Brecknock session. Soon they were invited to play at the Kapunda Celtic Music Festival – Kate's first gig. 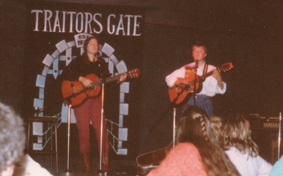 There followed many bookings, including Traitors Gate, live-to-air radio shows, political events and SA folk festivals. The musical emphasis was on gutsy singing, rich harmonies and competent guitar playing. It may sound funny now, but there weren't many women doing this at the time. Kate met Sean Mangan at the Brecknock and they quickly formed the duo 'Pitchblende'. Harmonies again were dominant, and arrangements expanded with the addition of violin, clarinet, glockenspiel, tin whistle and bongoes. The repertoire included trad and contemporary folk, jazz and rock, as well as some of Sean's original material (notably Dancing Ground). 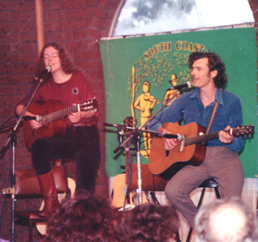 Memorable gigs were at National Folk Festivals (Maleny, Sutherland), Top Half Folk Festival (Alice Springs), SA folk festivals (of course), ABC national radio concerts and workshops (pre-recorded and live-to-air), and residencies at the Brecknock and Gilbert Hotels. The Revolving Door, a concert/workshop for the state Folk Festival exploring the theme 'women at work', drew together outstanding female performers from all over South Australia. One of its offshoots was a duo with Wendy Joseph. 'The Heavily Sisters' combined strong political themes with daft songs like I've Never Seen A Straight Banana, The Hostile Baby Rocking Song, It's Better With A Union Man. 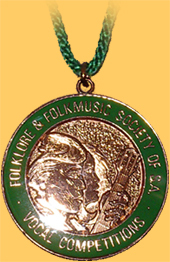 They played SA folk clubs, special events, and the National Folk Festival in Adelaide. 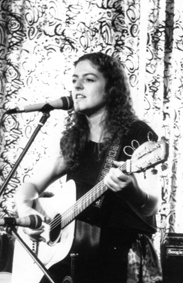 With the mentorship of Sean and Wendy, both accomplished songwriters and solo performers, Kate developed as a songwriter and found the courage to play solo. Two firsts came together on a single occasion at the Hills Folk Club: first performance of an original song and first solo gig. The first SCALA (Songwriters, Composers and Lyricists Association) gig meant developing an entire set of original songs to performance standard, duly delivered one memorable night at Stamps Café. From this moment songwriting became the linchpin of Kate's musical life, acknowledged with a number of awards coming her way from the SA Folk Festival, Kapunda Celtic Music Festival and South Australian Songwriters Events. A stint as concert programmer and publicist for SCALA provided the chance to meet a lot more songwriters and composers. Prominent composer/guitarist Julian Barnett and bass player Anthony Mellor ('Billy and the Redfins', 'Julian Barnett Ensemble', 'JBE') offered to provide instrumental backing for some of Kate's original songs, and a heady brew it was! ABC Radio collaborations included live-to-air broadcasts and recorded-for-broadcast special events. One was the SA Constitutional Museum opening celebration (pictured right). The most intense of them was when a group of South Australian musicians was brought together by Ray Smith at the instigation of David Mulhallen, producer/presenter of ABC FM's The Songs and Stories of Australia. 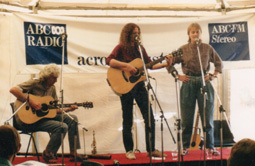 The project was to devise and perform in a series of themed concert/workshops to be recorded live at the South Australian Folk Festival and broadcast nationally in October and November of 1990. A Lost Heritage In Song focused on the work of South Australian songwriter Judith Crossley; Women In Song presented women's experiences since white settlement of Australia; Not a Jolly Swagman offered an alternative history of the colonial era; a fourth workshop dealt with the mighty Murray River; and yet a fifth explored the rich history of our railways. The ensemble comprised Julian Barnett, Cate Burke, Judith Crossley, Wendy Joseph, Kat Kraus, Sean Mangan, Anthony Mellor, Ray Smith, William Thackray, and a heavily-pregnant Kate Battersby. 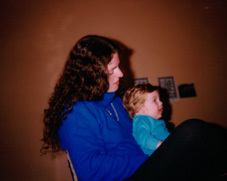 1991 was the big year of change. Babe-in-a-bucket became a familiar sight at South Australian music clubs, as the new little person was lugged all over the state in the wake of Mum's seemingly unquenchable thirst for music. 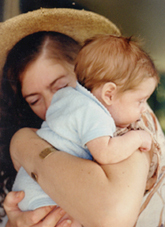 Kate mothered solo while maintaining a musical presence at the National Folk Festival, playing solo and continuing as a Heavily Sister. Noticing there weren't many songs being written at home, she instigated a songwriters' group at SCALA which challenged participants to write a song on a randomly-drawn theme in time for next week's session. This sometimes hilarious six-week exercise proved several things, the most publishable being that a song can definitely be written to order, no matter how bizarre the topic ('holy relics', 'yellow moon' 'counting sheep', to name just a few) and no matter whether someone thinks they are a songwriter or not. In this period Kate started gathering musicians with a view to forming a permanent band. After a few line-up changes 'St Elmo's Fire!' 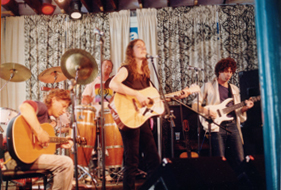 was born, with Kay Winnick on flute, Andy Rasheed on drums, Stewart Pope on bass and Tony Burke on guitar. 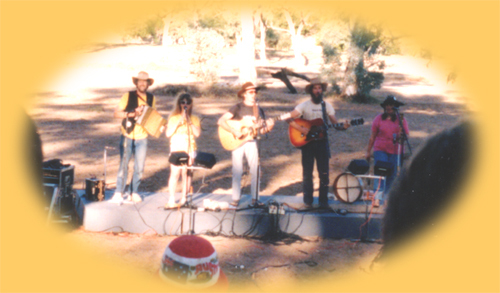 It was a shortlived permanency, but this group burnt hot, generating great sounds and producing memorable gigs at Music Works, SA Folk Festival and Clare Arts Festival. Years of close musical friendship brought together a new ensemble comprising Kate, Michael Coghlan, Sean Mangan and George Will. Three-part harmonies, with an array of guitars, mandolins, violin, clarinet and bass proved a stunning vehicle for members' original material and powerful voices, and the group quickly attracted attention. Recording was scheduled but, alas, thwarted when one member was called overseas in a hurry. Going back to law school proved the greatest challenge of all. Struggling to maintain her musical energy, and despite some fine moments collaborating with the likes of Kat Kraus, Kerryn Schofield and Michael Heim, Kate finally admitted to having too much on her plate. Faced with a choice between parenting, day job, mediation work, study and music, she made the difficult decision to turn down the volume on music for a while. There remained amazing Friday night sessions at The Gov, the always-welcoming SCALA, and occasional stage appearances at special events, festivals and fundraisers. No question, this album was overdue by a good 10 years – but hey, you can't rush these things! Despite several generous offers of assistance from local studios and entrepreneurs, the project could not get off the ground without the right producer. Ray Smith turned out to be that person, and thanks to the outstanding contributions of many fine musicians, over eighteen months the album developed just the sound and feel that Kate had been striving for. 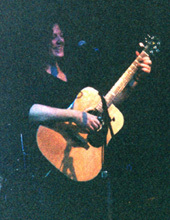 Full of Kate's original songs – the one exception penned by Sean Mangan – Urban Folk was recorded at Mixmasters, mastered at Disk-Edits, released in 2001 and launched at The Gov. Since releasing the Urban Folk CD – what an itch that scratched! – Kate has appeared live for SCALA, on ABC and 5UV Radio, at SA and Maldon Folk Festivals, played for fundraisers, and accepted occasional invitations to judge songwriting and music competitions. Meanwhile her musical development has taken some unexpected turns with the rekindling of a childhood passion for piano, embarkation upon further classical tuition, and acquisition of a bodhran: what can it all mean? Approaching her 20 year folk anniversary, Kate has been recently overheard saying the next project will be a new band, and involve a lot more covers. There are whispers of an interstate launch, and was there also something about getting back to her roots?? After writing that last paragraph, Kate was invited to join Adelaide folk/rock band The Legends who were known for a mix of covers + originals + traditional British and Celtic material. 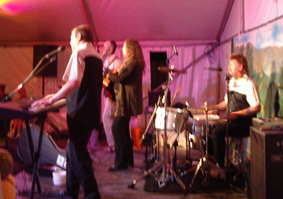 After an ecstatic reception at the Fleurieu Folk Festival late in 2005, the new Legends underwent a few more line-up changes before settling into what became the final core band of Kate with Dave Lambert and Istvan Nemeth, Ian Newton on the mixing desk, plus occasional guest drummer Dean Semmens. After several years of great times and forging lifelong friendships, the Legends banner was rolled up for good (maybe) after Dave took up residence in China and Kate moved to her new home in country SA. © Kate Battersby February 2006. All rights reserved.